Saudi Arabia's king has rejected suggestions his country should give up its role as organiser of the Hajj pilgrimage, following last month's deadly stampede. King Salman said he would not allow any "hidden hands" to politicise the tragedy and divide Muslims. An Iranian cleric had called for the Hajj to be managed by other Islamic states. 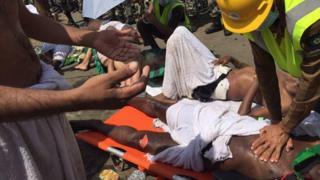 More than 1,480 pilgrims died in the stampede, foreign officials say. "The irresponsible statements aiming for political exploitation of the incident... shall not affect the role of Saudi Arabia, its duty and responsibilities in serving the guests of God," King Salman said in a statement carried by the official Saudi Press Agency. Iranian leaders have accused Saudi Arabia of mismanagement and ineptitude and called for an independent body to oversee the Hajj after the disaster, in which two crowds converged on a narrow road in Mina. The stampede killed at least 1,480 pilgrims, according to official statements from nations whose citizens died, including at least 464 Iranians and 177 Egyptians. If confirmed, the figure would make the stampede the deadliest-ever recorded accident to take place during the Hajj pilgrimage. The death toll given by Saudi Arabia's Health Ministry is 769.